While often eluding the attention of the everyman, ‘space’ has been a longstanding concern of geographers (and of great interest to scholars from many other parts of the academy). ‘Space’ has been variously treated as absolute, relative, and relational; as a container or backdrop; as a social, aesthetic, and material construct or production; as marked by geographies of power and social difference; as an experiential or perceptual realm; as represented and not representable; as topographical and topological; and as fixed and in constant flux. Now, this new title from Routledge’s Critical Concepts in Geography series provides the first authoritative reference work to enable users to make sense of space and spatiality in geography, and in related disciplines. 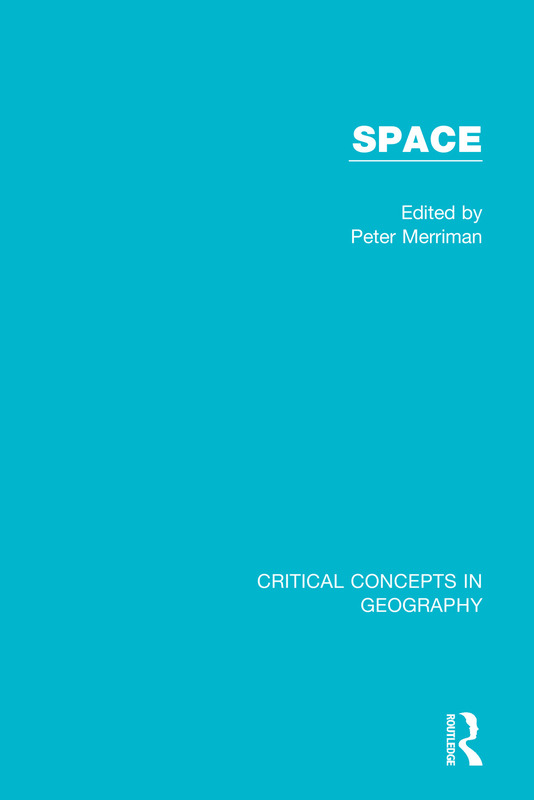 Edited by Peter Merriman, a prominent cultural geographer and author of Mobility, Space and Culture (Routledge 2012), Space is a four-volume collection of classic and cutting-edge contributions. The gathered works in Volume I explicate the philosophical and scientific foundations of contemporary thinking about space and spatiality, while the second volume examines the production of social, economic, and political spaces—tracing, for example, the emergence of social space in sociology and geography; Marxist writings on the socio-political production of capitalist spaces; studies of the spatialities of power; and different approaches to the emergence and constitution of spatial structures, networks, and relations. Volume III brings together important pieces on inhabitation, dwelling, and spaces of embodiment, identity, and difference. The final volume in the collection focuses on the vibrant and dynamic spatialities of the world, including poststructuralist examinations of how space is practised, performed, and in process; literature on the vibrant materiality, hybridity, and technological production of spaces; and a selection of major works which explore the cultural representation and articulation of spaces. With comprehensive introductions which situate the assembled materials in their historical and intellectual context, Space is an essential reference work for scholars and students concerned with the intersection of theories of space and place with questions of culture, politics, society, economics, power, identity, difference, and materiality. René Descartes, ‘The Principles of Material Things (extracts from Part 2 of Principles of Philosophy)’, in J. Cottingham, R. Stoothoff and D. Murdoch (translators), The Philosophical Writings of Descartes Volume 1, (Cambridge: Cambridge University Press, 1985 [originally published in Latin, 1644), pp.223-47. Isaac Newton, ‘Scholium to the Definitions’, in The Mathematical Principles of Natural Philosophy (Volume I), (London: HD Symonds, 1803 [originally published in Latin, 1686]), pp.6-14. Gottfried Wilhelm von Leibniz, ‘Extracts from the Third and Fifth Papers to Samuel Clarke’, in H.G. Alexander (ed. ), The Leibniz-Clarke Correspondence, (Manchester: Manchester University Press, 1956 [originally published in English, 1717]), pp.25-26, 63-64, 66-78, 89. Immanuel Kant, ‘The Transcendental Aesthetic’, in Marcus Weigelt (trans.) Critique of Pure Reason, (London: Penguin, 2007 [originally published in German, 1781]), pp.61-84, 674-676. Albert Einstein, ‘Relativity and the Problem of Space (Appendix 5)’, in Relativity: The Special and General Theory, (London: Routledge, 2001 [originally published in 1916]), pp.139-158. Richard Hartshorne, ‘The Concept of Geography as a Science of Space, from Kant and Humboldt to Hettner’, Annals of the Association of American Geographers, 48, 2, 1958, pp.97-108. Fred Lukermann, ‘The Concept of Location in Classical Geography’, Annals of the Association of American Geographers, 51, 2, 1961, pp.194-210. James M. Blaut, ‘Space and Process’, The Professional Geographer, 13, 4, 1961, pp.1-7. John D. Nystuen, ‘Identification of Some Fundamental Spatial Concepts’, Papers of the Michigan Academy of Science, Arts, and Letters, 48, 1963, pp.373-384. David Harvey, ‘Geometry – the Language of Spatial Form’, in Explanation in Geography, (London: Edward Arnold, 1969), pp.191-229. Robert D. Sack, ‘The Spatial Separatist Theme in Geography’, Economic Geography, 50, 1, 1974, pp.1-19. David Harvey, ‘Between Space and Time: Reflections on the Geographical Imagination’, Annals of the Association of American Geographers, 80, 3, 1990, pp.418-434. Doreen Massey, ‘Space-Time, "Science" and the Relationship Between Physical Geography and Human Geography’, Transactions of the Institute of British Geographers, 24, 3, 1999, pp.261-276. Neil Smith, ‘Space and Substance in Geography’, in P. Cloke, P. Crang and M. Goodwin (eds), Envisioning Human Geographies, (London: Arnold, 2004), pp.11-29. Rob Shields, ‘Knowing Space’, Theory, Culture and Society, 23, 2-3, 2006, pp.147-149. Joel Wainwright and Trevor J. Barnes, ‘Nature, Economy, and the Space　–　Place Distinction’, Environment and Planning D: Society and Space, 27, 6, 2009, pp.966-986. Peter Gould, ‘Space and Rum: an English Note on Espacien and Rumian Meaning’, Geografiska Annaler B, 63, 1, 1981, pp.1-3. Kenneth R. Olwig, ‘The Duplicity of Space: Germanic "Raum" and Swedish "Rum" in English Language Geographical Discourse’, Geografiska Annaler B, 84, 1, 2002, pp.1-17. Georg Simmel, ‘The Sociology of Space’, in D. Frisby and M. Featherstone (eds), Simmel on Culture, (London: Sage, 1997 [originally published in German, 1903]), pp.137-170. Anne Buttimer, ‘Social Space in Interdisciplinary Perspective’, Geographical Review,59, 3, 1969, pp.417-426. David Harvey, ‘Social Processes and Spatial Form: an Analysis of the Conceptual Problems of Urban Planning’, Papers of the Regional Science Association, 25, 1, 1970, pp.47-69. Henri Lefebvre, Extract from ‘The Plan of the Present Work’, in The Production of Space, (Oxford: Blackwell, 1991 [originally published in French, 1974]), pp.36-46. Edward W. Soja, ‘The Socio-Spatial Dialectic’, Annals of the Association of American Geographers, 70, 2, 1980, pp.207-225. Doreen Massey, ‘Politics and Space/Time’, New Left Review, 196, 1992, pp.65-84. Neil Smith and Cindi Katz, ‘Grounding Metaphor: Towards a Spatialised Politics’, in M. Keith and S. Pile (eds), Place and the Politics of Identity, (London: Routledge, 1993), pp.67-83. David Harvey, ‘Globalization and the Spatial Fix’, Geographische Revue, 3, 2, 2001, pp.23-30. Jamie Peck and Adam Tickell, ‘Neoliberalizing Space’, Antipode, 34, 3, 2002, pp.380-404. Noel Castree, ‘The Spatio-Temporality of Capitalism’, Time and Society, 18, 1, 2009, pp.26-61. Michel Foucault, ‘Space, Knowledge and Power’, Skyline: The Architecture and Design Review, March 1982, pp.16-20. John Allen, ‘The Whereabouts of Power: Politics, Government and Space’, Geografisker Annaler B, 86, 1, 2004, pp.19-32. David Harvey, ‘Space as a Keyword’, in N. Castree and D. Gregory (eds), David Harvey: A Critical Reader, (Oxford: Blackwell, 2006), pp.270-293. Mustafa Dikec, ‘Space as a Mode of Political Thinking’, Geoforum, 43, 4, 2012, pp.669-676. Helga Leitner, Eric Sheppard and Kristin M. Sziarto, ‘The Spatialities of Contentious Politics’, Transactions of the Institute of British Geographers, 33, 2, 2008, pp.157-172. Michel Foucault, ‘Of Other Spaces’, diacritics, 16, 1, 1986 [originally drafted in French, 1967], pp.22-27. James M. Blaut, ‘Space, Structure and Maps’, Tijdschrift Voor Economische en Sociale Geografie, 62, 1, 1971, pp.18-21. Torsten Hägerstrand, ‘Space, Time and Human Conditions’, in A. Karlqvist, L. Lundqvist and F. Snickars (eds), Dynamic Allocation of Urban Space, (Farnborough: Saxon House, 1975), pp.3-14. Anthony Giddens, ‘The Time-Space Constitution of Social Systems’, in The Contemporary Critique of Historical Materialism Vol.1: Power, Property and the State, (London: Macmillan, 1981), pp.26-48, 254-257. Allan Pred, ‘Contexts and Bodies in Flux: Some Comments on Space and Time in the Writings of Anthony Giddens’, in J. Clark, C. Modgil and S. Modgil (eds), Anthony Giddens: Consensus and Controversy, (London: Falmer, 1990), pp.117-129. Nigel Thrift, ‘On the Determination of Social Action in Space and Time’, Environment and Planning D: Society and Space, 1, 1, 1983, pp.23-57. John Shotter, ‘Accounting for Place and Space’, Environment and Planning D: Society and Space, 3, 4, 1985, pp.447-460. Bob Jessop, Neil Brenner　and Martin Jones, ‘Theorizing Sociospatial Relations’, Environment and Planning D: Society and Space, 26, 3, 2008, pp.389-401. Jonathan Murdoch, ‘The Spaces of Actor-Network Theory’, Geoforum, 29, 4, 1998, pp.357-374. Ash Amin, ‘Spatialities of Globalisation’, Environment and Planning A, 34, 3, 2002, pp.385-399. Sallie A. Marston, John-Paul Jones III and Keith Woodward, ‘Human Geography Without Scale’, Transactions of the Institute of British Geographers, 30, 4, 2005, pp.416-432. Martin Jones, ‘Phase Space: Geography, Relational Thinking, and Beyond’, Progress in Human Geography, 33, 4, 2009, pp.487-506. Peter Sloterdijk, ‘Spheres Theory: Talking to Myself about the Poetics of Space’, Harvard Design Magazine,30, Spring/Summer 2009, pp.126-137. Bruno Latour, ‘Spheres and Networks: Two Ways to Reinterpret Globalization’, Harvard Design Magazine,30, Spring/Summer 2009, pp.138-144. Lauren Martin and Anna J. Secor, ‘Towards a Post-Mathematical Topology’, Progress in Human Geography, 38, 3, 2014, pp.420-438. Maurice Merleau-Ponty, ‘The Spatiality of One’s Own Body and Motility’, in Phenomenology of Perception, (London: Routledge, 2002 [originally published in French, 1945]), pp.112-170. Martin Heidegger, ‘Building, Dwelling, Thinking’, in D. Farrell Krell (ed. ), Martin Heidegger: Basic Writings, (London: Routledge and Kegan Paul, 1978 [ originally prepared in German, 1951]), pp.323-339. David Lowenthal, ‘Geography, Experience and Imagination: Towards a Geogrpahical Epistemology’, Annals of the Association of American Geographers, 51, 3, 1961, pp.241-260. Edward Hall, ‘Distance in Man’, in The Hidden Dimension, (London: The Bodley Head, 1966), pp.107-122. Anne Buttimer, ‘Grasping the Dynamism of the Lifeworld’, Annals of the Association of American Geographers, 66, 2, 1976, pp.277-292. Christian van Paassen, ‘Human Geography in Terms of Existential Anthropology’, Tijdschrift Voor Economische en Sociale Geografie, 67, 6, 1976, pp.324-341. J. Nicholas Entrikin, ‘Geography’s Spatial Perspective and the Philosophy of Ernst Cassirer’, The Canadian Geographer, 21, 3, 1977, pp.209-222. Yi-Fu Tuan, ‘Space, Time, Place: A Humanistic Frame’, in T. Carlstein, D. Parkes and N. Thrift (eds), Timing Space and Spacing Time Volume 1: Making Sense of Time, (London: Edward Arnold, 1978), pp.7-16. David Seamon, ‘Body-Subject, Time-Space Routines, and Place-Ballets’, in A. Buttimer and D. Seamon (eds), The Human Experience of Space and Place, (London: Croom Helm, 1980), pp.148-165. Tim Ingold, ‘Against Space: Place, Movement, Knowledge’, in P.W. Kirby (ed. ), Boundless Worlds: An Anthropological Approach to Movement, (Oxford: Berghahn, 2009), pp.29-43. Elizabeth Grosz, ‘Space, Time and Bodies’, in Space, Time and Perversion, (London: Routledge, 1995), pp.83-101, 237. Kathleen M. Kirby, ‘Thinking Through the Boundary: the Politics of Location, Subjects, and Space’, boundary 2, 20, 2, 1993, pp.173-189. Kirsten Simonsen, ‘Practice, Spatiality and Embodied Emotions: An Outline of a Geography of Practice’, Human Affairs, 17, 2, 2007, pp.168-181. Setha M. Low, ‘Embodied Space(s): Anthropological Theories of Body Space, and Culture’, Space and Culture, 6, 1, 2003, pp.9-18. Bell hooks, ‘Choosing the Margin as a Space of Radical Openness’, in Yearning: Race, Gender, and Cultural Politics, (Boston, MA: South End Press, 1990), pp.145-153. Rosalyn Deutsch, ‘Men in Space’, in Evictions, (London: MIT, 1996), pp.195-202. Linda McDowell, ‘Spatializing Feminism: Geographical Perspectives’, in N. Duncan (ed.) Bodyspace, (London: Routledge, 1996), pp.28-44. Gillian Rose, ‘A Politics of Paradoxical Space’, in Feminism and Geography (Cambridge: Polity, 1993), pp.137-160, 197-201. Julie Lossau, ‘Pitfalls of (Third) Space: Rethinking the Ambivalent Logic of Spatial Semantics’, in K. Ikas and G. Wagner (eds), Communicating in the Third Space, (London: Routledge, 2009), pp.62-78. Bob Hodge, ‘White Australia and the Aboriginal Invention of Space’, in R. Barcan and I. Buchanan (eds), Imagining Australian Space: Cultural Studies and Spatial Inquiry, (Nedlands, Australia: University of Western Australia Press, 1999), pp.59-73. Natalie Oswin, ‘Critical Geographies and the Uses of Sexuality: Deconstructing Queer Space’, Progress in Human Geography, 32, 1, 2008, pp.89-103. Michel de Certeau, ‘Spatial Stories’, in The Practice of Everyday Life, (Berkeley and London: University of California Press, 1984 [originally published in French, 1980]), pp.115-130, 221-222. Gunnar Olsson, ‘The Social Space of Silence’, Environment and Planning D: Society and Space, 5, 3, 1987, pp.249-262. Chris Philo, ‘Foucault’s Geography’, Environment and Planning D: Society and Space, 10, 2, 1992, pp.137-161. Marcus A. Doel, ‘A Hundred Thousand Lines of Flight: a Machinic Introduction to the Nomad Thought and Scrumpled Geography of Gilles Deleuze and Félix Guattari,’ Environment and Planning D: Society and Space, 14, 4, 1996, pp.421-439. Jean Baudrillard, ‘Hyperreal America’, Economy and Society, 22, 2, 1993, pp.243-252. Bruno Latour, ‘Trains of Thought: Piaget, Formalism and the Fifth Dimension’, Common Knowledge, 6, 3, 1997, pp.170-191. Verena Andermatt Conley, ‘Processual Practices’, The South Atlantic Quarterly, 100, 2, 2001, pp.483-500. Gillian Rose, ‘Performing Space’, in D. Massey, J. Allen and P. Sarre (eds) Human Geography Today, (Cambridge: Polity Press, 1999), pp.247-259. Nigel Thrift, ‘Space’, Theory, Culture and Society, 23, 2-3, 2006, pp.139-155. Peter Merriman, ‘Human Geography Without Time-Space’, Transactions of the Institute of British Geographers, 37, 1, 2012, pp.13-27. Karen Barad, ‘Re(con)figuring Space, Time, and Matter’, in M. DeKoven (ed.) Feminist Locations: Global and Local, Theory and Practice, (London: Rutgers University Press, 2001), pp.75-109. John Law, ‘Objects and Spaces’, Theory, Culture and Society, 19, 5-6, 2002, pp.91-105. Nigel Thrift and Shaun French, ‘The Automatic Production of Space’, Transactions of the Institute of British Geographers, 27, 3, 2002, pp.309-335. David Harvey, ‘Time-Space Compression and the Rise of Modernism as a Cultural Force’, in The Condition of Postmodernity, (Oxford: Blackwell, 1990), pp.260-283. Bernard Tschumi, ‘Questions of Space’, in Architecture and Disjunction, (London: MIT Press, 1996), pp.53-62. Thomas F. McDonough, ‘Situationist Space’, October, 67, 1994, pp.59-77. Laura McMahon, ‘Jean-Luc Nancy and the Spacing of the World’, Contemporary French and Francophone Studies, 15, 5, 2011, pp.623-631. Derek Gregory, ‘Cultures of Travel and Spatial Formations of Knowledge’, Erdkunde, 54, 4, 2000, pp.297-319. Derek P. McCormack, ‘Geographies for Moving Bodies: Thinking, Dancing, Spaces’, Geography Compass, 2, 6, 2008, pp.1822-1836. Critical Concepts in Geography is a series in Routledge’s Major Works publishing programme. Designed to meet research, reference, and teaching needs across the humanities and social sciences, Routledge Major Works gather together the best and most influential work on particular concepts, subjects, and individuals. The collections assemble previously published articles from a variety of journals, excerpts or chapters from previously published books, and materials from other sources which together provide users with historical purchase on the concept, subject, or individual in question, as well as a thorough overview of current issues.